For those who are in Toastmasters in the Chicagoland area, there is an event happening today and tomorrow which I personally call “Disneyland for Toastmasters” called the Spring Conference. The Spring Conference takes place on Friday evening and all day Saturday evening, 4/29 and 4/30, respectively. The reason why we are doing the conference in one and a half days is because there is too much going on to have it in a single day. Getting my Triple Crown award at the Achiever’s Breakfast, an award for getting three educational awards from Toastmasters in a single year. I got the Leadership in Excellence award, the Advanced Leadership Silver award, and the Distinguished Toastmasters Award all in the same year, which qualified me for the Triple Crown award as well. At the busines meeting, I was elected Director of the South Division. I sat by my fellow Windy City Professional Speakers Club member Nancy Depcik in the hallway as she awaited her turn as the last speaker out of nine in the International Speech Contest. I told her stories to get her mind off of the impending contest, which she said helped her relax and stay focused rather than worrying about the applause, laughs, or other reactions the other speakers were getting. Finally, at dinner I found out at the announcements for the winners that Nancy Depcek came first in the District and is going on to Washington for the World Championship of Public Speaking. I got my DTM medallion in a ceremony where I shook the hand of every person in District 30 who has a DTM award already, welcoming me into the family as it were. It was a great experience, I think I’ll be processing what went on to do for months to come! Here’s what’s on the menu for the conference program tonight (Friday). I will probably have a lot more to report on tomorrow–tonight I’m going back down to the hotel main floor to watch the rest of the Table Topics and have some drinks with fellow Toastmasters afterwards. That’s why this time I got a hotel room at the conference, so I could socialize without having to leave early for the hour drive home. It’s a Toastmaster holiday and I want to enjoy every moment that I can! Tomorrow at the District 30 Toastmasters Spring Conference, I am throwing the proverbial hat in the ring and running for Division Director position of the South Division. Actually, I threw my hat in the ring months ago, but tomorrow is the election, because the Division Director is an elected position, as opposed to the Area Director position, which is an appointed one. I have been preparing for this position for quite some time, and I wanted to pass on my ideas on how to prepare yourself for success as a Division Director for those considering the position. Be an Area Director–since you will be directing all of the Area Directors in your Division, you need to know from their perspective what they will need to be doing in their roles. Be an Asst. Division Director–all this past year, I have assisted the current Division Director in order to find out what the Division Director position entails. I have attended all of the District Executive Committee or DEC meetings, I have assisted with all of the Area and Division level Speech Contests, and helped with other areas such as running the Division makeup training for club officers who have not attended the District-level Toastmasters Leadership Institute. Besides learning how to do the job, I have gotten to know the people at the District level of leadership. I will go into the Division Director position hitting the ground running because I already know and have worked together all of the people I will be dealing with. Recruit an Asst. Division Director–I hope I have been helpful to the Division Director, but I knew that going into the Division Director is still a daunting task even if I have already practiced it a year as an Assistant myself, so I was sure to recruit an Asst. Division Director who will help me with the planning of all the events in the Toastmasters year. He is a fellow project manager and understands the need for good planning. Recruit and interview the potential Area Directors–you can’t choose the Area Directors, you can only recommend them to be chosen by the incoming District Director. However, the selection process by the incoming District Director can be made easier if you yourself gather information on the Area Directors, including: a) their previous leadership experience at the club level, b) their ability to use computers, which is crucial in doing some of the tasks they must accomplish, and c) what they want to get out of the position in terms of leadership growth. In between the lines, the interview should be an opportunity for you to judge what kind of a fit this person will have with you and the rest of the team. Have a pre-planning retreat with your Area Directors–the Asst. Division Director are planning to have a planning retreat with all of the Area Directors in the month of May BEFORE the regular training takes place. This will give us a chance to present to the Area Directors what the requirements and benchmarks they will have to clear from the District perspective. And then, rather than say, “you should start doing your Club Visit reports in July”, we will put the District calendar including all relevant deadlines on a whiteboard and ask the Area Directors to help us put together a plan of when they have to get things done. As far planning is concerned, if they are just shown it, they won’t own it. They have to participate in the planning if they are to buy into why they have to complete certain tasks. This will not guarantee success as a Division Director, but it will greatly put the odds in your favor. These are just suggestions, and anyone who is a Toastmaster who either has been a Division Director or who is planning on being one is welcome to give me feedback on other tips for success. To the best of success in the 2016-2017 Toastmasters year which starts July 1st, 2016! Klaus Schwab, the Founder and Executive Chairman of the World Economic Forum wrote an article for Foreign Affairs magazine on January 14th of this year entitled: “The Fourth Industrial Revolution: what it means, how to respond”. 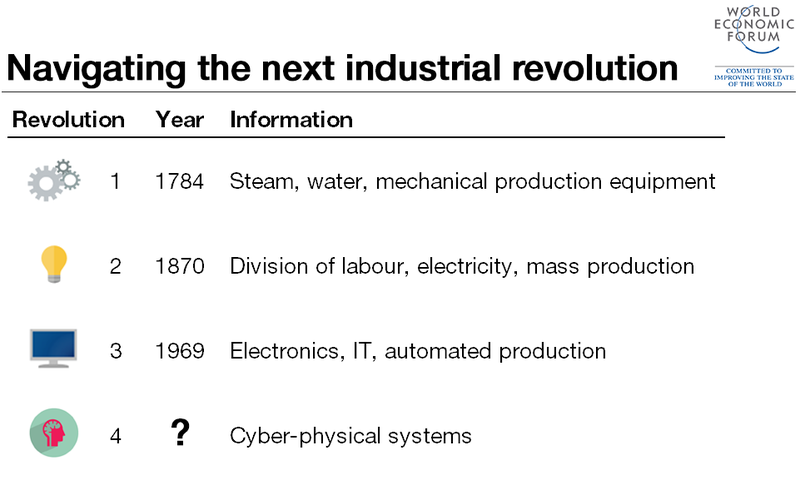 In this post, I will discuss his article, the article “This is the business model needed to master the Fourth Industrial Revolution” by Knowledge@Wharton, and the book “Collective Disruption” by Michael Docherty. The first industrial revolution harnessed the power of steam to production and ushered in the age of mechanized factories. The second industrial revolution harnessed the power of electricity to create mass production. The third industrial revolution harnessed the power of electronics and information technology to automate production. Here’s an example of just one of these categories, energy storage. I attended a TEDx talk given at IIT by Dr. John Katsoudas talked about how nano-liquid can be the breakthrough that is needed to jump-start the market for purely electric vehicles. At present, electric vehicles suffer the problem of limited range due to the limited ability of the current state of technology to store energy in its batteries. By taking nanoparticles and incorporating them in a conductive fluid, the resulting nano-fluid has an energy storage capacity that outstrips the current state of battery technology, thus making a battery that could create an electric vehicle with a range rivaling that of current gasoline vehicles. This could be the bridge to a purely electric-vehicle market. Klaus Schwab contends that the technologies listed above that comprise the Fourth Industrial Revolution are having a major impact on businesses on the supply side, by agile competitors disrupting existing supply chains, and on the demand side, by growing consumer engagement forcing new ways to design, market and deliver products. Although the third industrial revolution involved the first three types of capital, it is fourth type of capital, network capital, which is the new type of capital required to succeed in the Fourth Industrial Revolution. For an example of a model which attempts to build that network capital, I refer you to the book “Collective Disruption: How Corporations and Start-Ups can Co-Create Transformative New Businesses” by Michael Docherty. Large companies can avoid falling behind in the Fourth Industrial Revolution by partnering with entrepreneurs and start-ups to create a network he calls an “innovation ecosystem” to help companies create not just new products but also entirely new lines of business. As a Project Director for the Leadership Forum 2016 event being held at the Project Management Institute’s Chicagoland chapter, I am organizing a forum to be held on May 20th, 2016 where we are inviting over 150 executives to discuss Michael Docherty’s book. The forum is called Strategy for Innovation: The PM Advantage because those projects created through the process of collective disruption will require project managers who are able to speak in the traditional project management “language” that big companies are used to, and the newer language of “agile” project management which is what start-up companies are more conversant with. This issue is so important that we are having the Chair of the Board of PMI Global, Antonio Nieto-Rodriguez, to come and speak about it. Our forum is designed to get the conversation going, as the first step in making Chicago not a bystander, but an enthusiastic participant in the forefront of the Fourth Industrial Revolution. District 30 Toastmasters covers the Chicagoland area (the city and surrounding suburbs) and here is the official list of the top 10 reasons for attending, according to the District 30 website. 10. Hospitality of the Skokie Holiday Inn–rather than stay late Friday night and get up early Saturday morning, stay at the Holiday Inn and be able to RELAX and enjoy the event! 8. District 30 Toastmasters Got Talent Show–I tried to enter this event, but it was so popular, that the entry list was closed weeks beforehand. Better luck in the Fall! 7. Network and have F-U-N!–I see all the people I’ve come to know over the past half-year, and I get to meet a lot of new ones. 6. Awesome Educational Sessions–learning how to be a better speechwriter? How do use improvisational techniques in your speeches? Do you want to learn how to do a High Performance Leadership Project? Do you want to learn how to become a professional speaker? Come to the educational sessions and find out! 5. Table Topics and International Speech Contest–these contests started back in January at the club level. For those of us who have been behind the scenes running Area and/or Division Contests, it is thrilling to see people who have improved their club level speech when going to the area level, and then who have improved their area level speech when going to the division level. Now the division finalists need to improve one more time to go to the district competition. So it like seeing your child go from Little League to the World Series! 4. To SOAR For Your Success!–get inspired by the examples of speakers and leaders to finish the rest of the Toastmaster year in style. 3. Proudly Carry the Club Banner in the Parade of Banners–strut your stuff for your club! 2. Hear Keynote Speaker Jana Barnhill, DTM, PDG, AS, PID, PIP–her Toastmaster pedigree is longer than her name. One of the pioneering women of Toastmasters will distill for us the experience she has gained and give us advice on how to be better leaders. 1. To Share Your Own Uniqueness–each person has their personality, and each club does as well. Meet the individuals who have taken their membership and made it into a thing of beauty by adding their own personality to the mix! I would add an additional reason for going to the Spring Conference, and that is because I am running for a Division Director position and am going to be giving my “stump speech” at the Business Meeting. In addition, the business meeting will discuss many important topics, such as how District 30 will split into two during the coming year: one district will be downtown Chicago and the South Suburbs, and one district will be all of the surrounding suburbs except the South Suburbs. It’s not a punishment, it’s a reward as a result of the constant growth that the District 30 Chicagoland has displayed in the past few years. It has reached the “magic” number of 240 clubs, which according to our parent organization Toastmasters International, is where a district needs to consider splitting in order to create districts that are manageable. It will be a two-day Toastmasters version of Disneyland, in my opinion, and I look forward to enjoying every moment. One of the main reasons why is ANOTHER reason for going to the Spring Conference, namely, to get presented with a medallion in recognition of the fact that after 5 years in Toastmasters, I am finally going to achieve the highest level of personal achievement, namely, the Distinguished Toastmaster award! At first when I joined I thought becoming a DTM was like going to the top of Mount Everest. No, I realize now that it is in reality just base camp. There’s a whole mountain range awaiting for me, as Jana Barnhill, PIP (Past International President) can attest to! In this post, I will discuss the first risk in focus, the Disempowered Citizen. Social instability has become a risk of increasingly prominent concern in the past few years. It is one of the top three risks in two global regions, Latin America & the Caribbean and the Middle East and North Africa. In the past two decades, there has been a rise in the number and intensity of protests around the globe, the most recent wave being associated with the Arab Spring in 2011. These trends causes attitudes that demand reform, and as institutions are unable to comply with those demands, trust in institutions, both businesses and governments, is plummeting. The businesses in such a society face adverse consequences, as there is an economic slowdown and an environment that is not conducive to doing business. When people feel disempowered as citizens, they try to recapture that sense of empowerment as consumers, and often create movements like boycotts to affect social change which they feel the government is not capable of implementing. In the next post, the Global Risk Report discusses some suggestions to mitigate this risk.